Whether you’re fulfilling you household or business needs, washcloths are an essential addition to any location where drying is necessary. Here at Towel Super Center, our washcloths are crafted to fulfill your towel needs. Measuring a reasonable 13” by 13”, our premium plus washcloths are conveniently sized to fit your home, salon, gym or spa! Whenever you need to conveniently and efficiently dry your hands, face or feet, our premium plus washcloths are an ideal choice. Without the added weight or size of a traditionally longer bath towel, washcloths pack a powerful punch with their ability to absorb efficiently and quickly. Gyms: Cotton is a breathable fabric by nature, known for its ability to efficiently absorb liquids such as sweat. Made from 100% high-quality cotton, our premium plus washcloths offer precisely the absorption qualities you’re looking for in a washcloth for your gym. They provide a resourceful alternative to paper hand towels, which are quickly thrown away soon after use. Offer them stacked in the locker room and draped conveniently throughout your gym to ensure your customers reap the benefits of these quality absorbing cotton cloths. Our premium plus washcloths offer a sanitary way to clean up excess sweat so your clients can continue exercising without discomfort. Salons or Spas: Due to the constant washing of hair and nails, as well as other grooming acts, every salon and spa needs a powerful towel to absorb water while providing comfort for the client. Made from the highest quality materials, our towels provide your clients with the pampering they deserve. Let them sit back and relax — our gentle and soft washcloths will handle the rest. Hotels: Every guest wants to walk into a hotel room shelfed with dazzling white, soft towels. Our 100% cotton material ensures ultra-soft drying for your client’s hands, face and feet. Our towels absorbing ability also makes them a powerful tool for cleaning up the rooms once the guest has left, better preparing the space for the arrival of the next visitor. 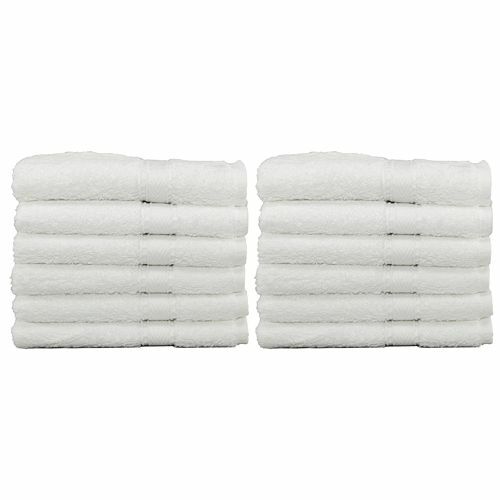 Our premium white washcloths are the classic washcloths for any hotel, salon, gym or general home bathroom. They work well with any bathroom décor, and the high-quality cotton ensures they last a long time while continuing to look great. You’ll never have to worry about abrasion or pulling when using our towels on your skin because our washcloths are absorbent and ultra-soft. In addition, our white washcloths are easy to launder and will generally wash in one wash cycle, although heavy soiling may need you need to run them for two wash cycles. If you have any questions or inquiries, you’re always welcome to call a representative whenever you need your towel necessities filled! Our goal at Towel Super Center it provide you with the quality products you desire at an affordable price.